*Once the resources are planned and reviewed, there are periodic processes to run that moves the data to correct places so that inquiries can be performed on them. This section details out those periodic processes. 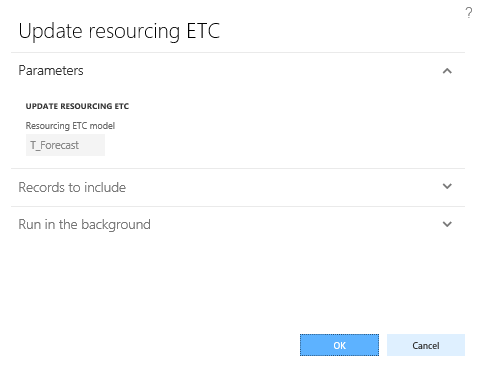 The Update resourcing ETC is used for moving the Estimate to complete resourcing lines into a separate forecast model file. ETC stored in a separate forecast model will give the project managers the total estimate to complete and how much more work is still pending per project. This form can be launched from the project and also under the periodic menu too. Go to Project and management accounting > Projects > All Projects > Plan tab > Project resource section > Update resourcing ETC. Once clicked on the Update resourcing ETC button, below form opens. The estimate to complete considers the hours from the Project booking form lines for transfer, irrespective of whether there is a worker or not. If there is a worker on the resource line – then the last non-draft timesheets are considered, as the from date to be more precise the date after the end date of the timesheet into the future. Only booked hours are considered for transfer to forecast. For example, if the resourcing line has 15th Aug to 31st August, then the last non draft timesheet of the worker is 21st August (Timesheet period – 15th to 21st) then the data for 22 is considered till 31st August, 2016. All the attributes that are there on forecast model which are being used for grouping is taken into consideration for grouping of the transactions that are transferred to forecast form. The parameters for copying will be taken from the Forecast model, similar to WBS Updates to forecast models for the Estimate to complete. Grouping of copied lines to be either in days, weeks, months or Total (one summarized line), whatever option is defined on forecast model. The pricing also to be picked from either the source transaction or from the pricing tables as specified on the Forecast model. The forecast model to be used for copying to is defined on the parameter in Projects+ parameter under Resourcing group.